In 1992, Nick Leeson, a 25-year-old Englishman, began a job in Singapore as a derivatives trader with Barings Bank, a 300-year-old British financial institution. But within three years, Leeson lost $1.2 billion worth of Barings' money and put the venerable old bank out of business. And in 1995, Leeson began a six-and-a-half-year sentence in Singapore's Changi Prison after being convicted of forgery and cheating. Other traders have posted bigger losses. But Leeson's brazen fraud made him the poster child for greed and stock market excess... and probably the most famous "rogue trader" of all time. Barings – then one of the most respected, and stuffy, "old school" banks – was at fault, too. It had almost laughably bad oversight. The bank's biggest mistake was allowing Leeson to make trades – and be the point person in the back office to settle trades. This allowed him to manipulate trading accounts and hide huge losses. However, the mistakes that lost Leeson money as a professional trader were the same mistakes that lead individual investors to lose money – he just made them on a much bigger scale. Leeson was a successful trader at first. He was reportedly responsible for 10% of Barings' profits in 1992 – a huge amount for one person. Based on that track record, the bank gave young Leeson a lot of freedom to trade complicated derivatives. Both Leeson and his employer were fooled by his amazing success into believing he had unusual talent. But as it turns out, he may have just been lucky. Skillful investing is often nearly impossible to distinguish from dumb luck. As the saying goes, "Don't confuse brains with a bull market." Avoid the trap of "doubling down." The strategy of doubling down can be seductive to gamblers – when you have a loss, double your bet to get back what you lost. A lot of Leeson's success in his early trading career came from doubling down when trades initially lost money. A trader who always doubles down on losing positions may make money and look smart – but only as long as his "luck" holds. Once luck runs out, a string of losses leads to larger and larger bets. In a casino, the house shuts the gambler down when his bets get too large. With traders, a brokerage firm requires more money up front, stops any trading in the account, or begins selling stocks in the account before the trader's decisions become dangerous to the firm. But due to Leeson's fraud, he could cover up his own mistakes. Barings had no clue. By the end of 1994, Leeson's losses had climbed to $352 million. That's a lot of money, but Barings could have absorbed it if it had stopped there. But Leeson was obsessed with recovering his losses. The beginning of the end for Leeson came in January 1995, when he placed a huge long bet on Japan's Nikkei stock futures. In a classic Black Swan moment, the Kobe earthquake occurred overnight, and the Nikkei plummeted. As a result, Leeson was dealing with losses worth more than the value of the entire bank. Leeson dug deeper and increased the amount of money invested in Nikkei futures to $7 billion. The market kept falling. On February 23, 1995, Leeson and his wife fled Singapore for Malaysia, and eventually Germany. He left behind a note saying, "I'm sorry." After a brief global manhunt, Leeson was arrested in Germany and extradited back to Singapore for trial. Leeson was obviously an extreme case. But any investor can dig himself into a hole so deep that he ends up in financial ruin. Follow a disciplined, logical investment plan. Barings needed better policies for controlling risk. But Leeson's mistakes could have been avoided if he had a well-thought-out trading plan. For one thing, Leeson should have had a stop loss strategy in place. Cutting losses is one of the basic rules successful traders follow. Also, Leeson didn't respect the double-edged sword of leverage, or borrowing money to invest. Using leverage is a legitimate strategy that works great... when markets are going up. It's like someone taking out a mortgage to buy property and then "flipping" it – selling it quickly for more money. It only works when prices are going up. If they start falling, the borrower is left with a property that's worth less than what he paid – and a large debt. If an individual investor has a good investment strategy, he will know to cut losses and to use margin prudently. What is striking about Leeson's time with Barings is that he did all his work alone – the very definition of "rogue." As the bank's losses spiraled out of control, he was by himself. Everyone at Barings, from management to co-workers, thought he was making huge profits. Even his wife was completely in the dark. Trading and investing can be emotionally taxing for anyone. In Leeson's case, he was young, inexperienced, poorly supervised, and isolated. Add in the fact that he had access to hundreds of millions of dollars of his company's money, and no one should be shocked that he made some disastrous – and expensive – decisions. For investors, the lone-wolf style of investing is a bad idea. Discuss your ideas and plans with friends and mentors. Operating in secret is stressful and can lead to bad decisions. Leeson learned these five lessons the hard way – but you don't have to. Follow these steps to set yourself up for success... and avoid catastrophic losses. Editor's note: Kim and his team recently uncovered a new industry poised to explode in the coming months and years. Right now, he's sharing four specific ways to get in on this boom... And he says early investors could make as much as 1,000% over the long term. But you need to act quickly, before the herd stampedes in. Get the details here. "'Dr. Internet' made a particular kind of investing mistake," Dr. David Eifrig writes. "And unfortunately, it led him to financial ruin." Find out how to avoid this mistake – and manage your investment risk – right here. Seeking out experts with firsthand experience can help you stay grounded and give you valuable feedback as an investor. Recently, Steve sat down with one such man to get his insights on a feared corner of the market... Learn more here. 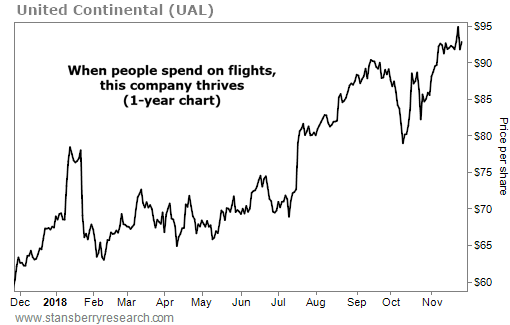 United Continental (UAL) is one of the top airlines in the U.S. It has more than 750 planes in its mainline fleet, allowing it to operate around 4,700 flights a day. All these flights add up. In 2017, United carried more than 148 million customers. And when the economy is booming, people spend on travel… In the most recent quarter, United reported sales of $11 billion, up more than 11% from the same period last year.